There is no substitute for fresh chunky salsa, so give up that bottled stuff and go for it! You'll be pleasantly surprised at how easy it is to make your own salsa, and how fast it goes together. Your guests will rave, and if they don't eat it all in one sitting, they'll be begging to take some home. This homemade salsa is easy to control heat-wise. If you do not like it hot, it is just as good without the chile. If you like it hot, add more or experiment with hotter chilis. Feel free to adjust it to your own tastes. Likewise, there are those who can't tolerate the taste of cilantro. You can leave that out if that is the case for you or your guests. 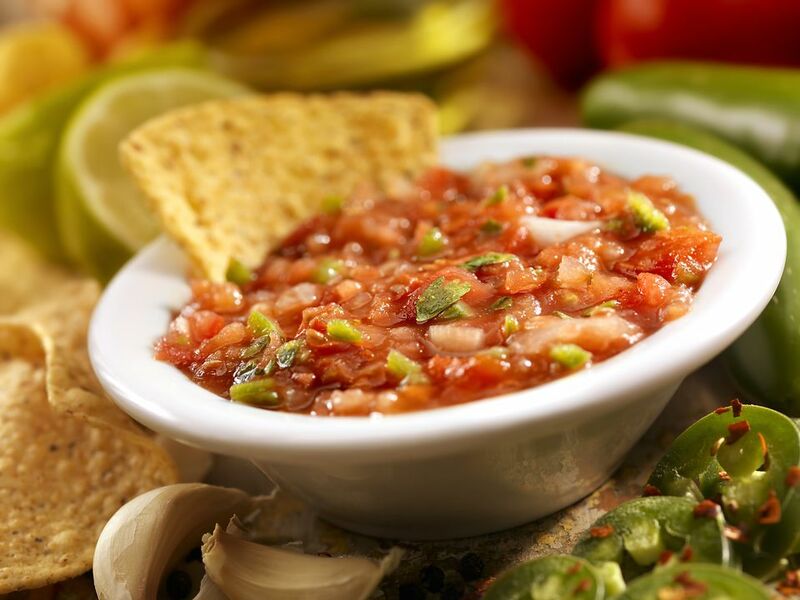 Chunky salsa is great with Mexican dishes as a condiment or simply with tortilla chips as a snack or appetizer. Add it to a little mayo or sour cream for a southwestern salad dressing. Serve salsa for breakfast with eggs, omelets, or frittatas. Of course, you can enjoy it with tacos, burritos, and wraps. Combine Serrano chile, tomatoes, red or sweet onions, green onions, cilantro, cumin, chili powder, oregano, garlic powder, tomato sauce, green chiles, red wine vinegar, salt, and pepper. Let sit overnight to let flavors blend. Serve with crisp tortilla chips as a dip or serve as a condiment with other dishes. Store any leftover salsa in a covered container in the refrigerator for up to two weeks (although it's best if you can eat it within five days). This recipe produces a large amount of salsa, six cups. You can cut the recipe in half if you won't be using it up in a few days. You may also freeze portions of the salsa in freezer bags to preserve it for several months. You can then thaw it before using and enjoying it. If it seems to have lost some texture after being thawed, you can always process it briefly in a food processor so it is blended rather than chunky.